Both Senate Votes To Reopen Government Fail To Pass, Six Republicans Voted For Plan Offered By Democrats - Joe.My.God. The Republican-backed Senate proposal to reopen the government, which included $5.7 billion to fund President Trump’s border wall, failed to garner the 60 votes needed in a procedural vote Thursday to advance the measure. The final tally for the Republican proposal was 50-47. Republican Sens. Mike Lee (Utah) and Tom Cotton (Ark.) — an immigration hardliner — voted against the bill. Democratic Sen. Joe Manchin (W.v.) voted in favor. 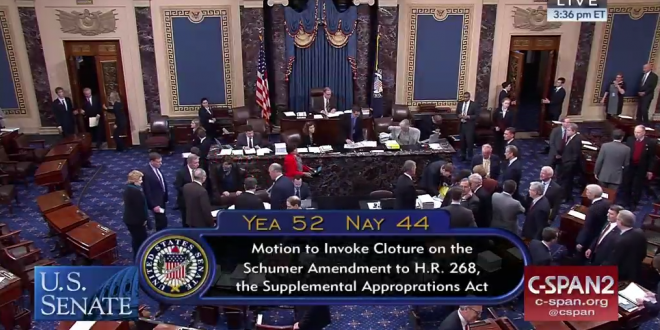 The Democratic proposal failed 52-44.